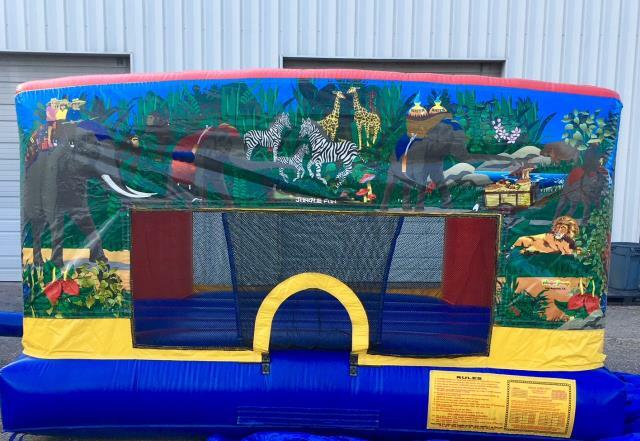 This Jungle themed bouncer is the perfect solution where you're facing height limitations. With it's 7'10" total height, this unit will fit almost any indoor facility. This unit can also be used for outdoors too! High-visibility mesh around all sides allows spectators to view easily. Unit manufactured with lite n strong , the only 15 oz lightweight and fire resistant vinyl. * Please call us for any questions on our jungle mini bouncer rentals in Rocky Mount and Wilson NC.